Hi everybody! How is your Raya holiday coming along? Yesterday morning B and I had an early "morning adventure" where we left home at the break of dawn to have breakfast outside! We hardly ever have a morning adventure with B working on weekdays and me waking up late daily. So yesterday we made a point to get up really early (my system had a shock showering at 7am!) and have breakfast outside! It was fun because after enjoying a hearty breakfast outside, we could go home and resume sleep since it's a holiday and B doesn't have to go to work! Tomorrow, we're planning to get up early again and drive to SSF to check out the garden decorations there. I hear there is a great rain barrels for sale offer and I 'm planning to get some rain water barrels for MIL and her garden. Since we don't have a garden of our own (living in a condo and all) we take joy in decorating MIL's garden and she doesn't seem to mind. 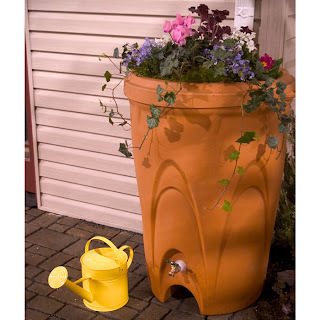 Nowadays you can find some really cool rain barrels, which many garden owners use to beautify their gardens. I hope to find something like this tomorrow. 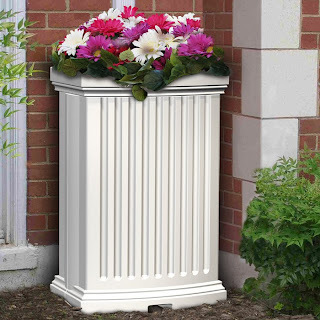 This pretty white rain barrel comes in one piece with consistent, even wall thickness and will not leak due to a split seam. I think it's perfect because it has a dual function. Besides watering the flowers it displays, you can also attach a drip hose to the shut-off valve connection and water your surrounding flower beds at the same time, which I thought was very cool! If you like what you see here, please visit Simply Rain Barrels - the ultimate source for all types of rain harvesting barrels and equipment. Offering hundreds of different high quality rain barrels and accessory products, each item comes with a 110% low price guarantee! So it looks like I will be doing some garden shopping tomorrow. How about you? What are your plans this Raya holiday? wah GP.. morning person also is ti? lol!! Speaking of rain, it has been raining heavily for the past few days. Wah Marzie, syiok tuu bangun awal pergi sarapan tanpa rasa kelam kabut. I am having a great holiday! Driving round PJ/KL is so enjoyable! I purposely woke up early to drive! Haha! Wah! You decorate your MIL's garden for her? Good DIL! Where to find? Haha! Yalah, stay in condo no garden. That's one of the reason why I prefer landed property. Got garden but one condition is must have someone take care of the garden lah! Recent blog:=- It is 20-09-2009! Selamat Hari Raya Folks! Ouh...so you guys wanan do some serious gardening? Don't forget to show us yeah! :) Got koi pond or not? Nope not this year ECL he he…but I’m sure u enjoyed lotsa Raya goodies this year? Eh no la not serious gardening, little bit only Tekkaus muahahahhaha! Yeah la I know u wake up damn early Tekkaus lol! I love staying in a condo Foong but a garden would do nicely for my kids, meow! So who does ur gardening Foong? He he or u just leave it unattended ha ha! Oh good to hear that Foong, so nice to drive around when there’s no traffic! Thanks Jackie, do u have one in ur garden?? I hope u can start chopping here too Ayie! I used to celebrate raya in the US too Ayie when we were living there last time…. My weekend was busy Ayie, how abt you?